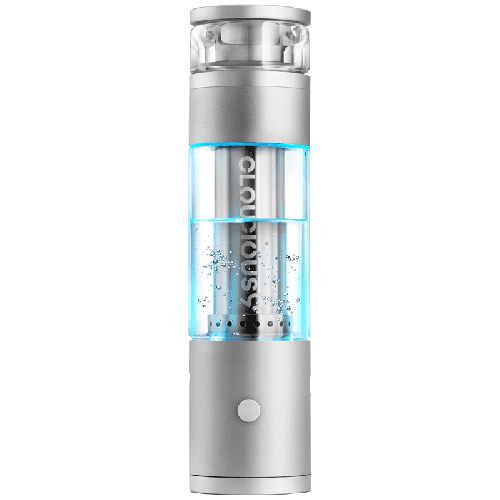 Cloudious 9 is shaking up the industry with the revolutionary Hydrology 9 Vaporizer. Meticulous craftsmanship is an instant indicator that this portable vape is like no other. Leak-proof water filtration soothes and cools your vapor, while the integrated oven stir tool ensures your materials are always evenly vaporized. Cloudious9 used only top-notch quality materials to manufacture this premium device, from aircraft quality aluminum that refuses to rust to porcelain oven that combines with the borosilicate glass. I am consumed with nostalgia and delight. In my earlier years, a bunch of pals pooled together our allowances to get a bong that was the highlight of our summers. After strictly vaping for 3 years, something was missing. I had a great idea but Cloudious9 beat me to it. It delivers like a bong but much smoother. I recommend this for reaching new levels that the traditional vapes do not get me to, outside of concentrates. It is hard to gauge how much you take in, resulting in huge bong like clouds. It does however filter out the unique tastes of strains because of its smoothness. I use my firefly 2 to appreciate the flavors, nothing compares to it. My pax 2 is like the Ak47 of vaporizers, sturdy and always reliable, a must have when engaging in outdoor adventures like mountain biking, kayaking, hiking and camping. I use the hydrology 9 when I want to get to the place that bong rips encourage (the couch or hammock). I think it could benefit from a better charging connection like the newer iPhones use. The battery life allows for 6-8 long sessions. A single session is too long for just me, as I end up coughing my brains out. I prefer a little cough. It was the vape to complete my collection. I love this Vaporizer. Good draw resistance, great hits. You can’t go wrong this Cloudious 9. I had been following the development of this for quite some time Bought it as soon as it came out. use it daily and love it! I really enjoy using the hydrology9, knowing that the smoke or vapor goes through 2 filters before going into me make me feel more relieved and clean in general about consuming cannabis. Also this device has cool led lights that look awesome in a dark setting. I’m new to this product and have only had it for a few days. It does live up to its promise. If you want the best for special occasions, this is a great vape to use. That being said, it’s rare that I need such an extravagant vape. But that’s no reason to complain. It’s just that when you add water to a vape it makes cleaning often more important. I’m happy with a simpler device, but this thing is quite impressive. Cloudious9 warrants that the materials with which the Product is furnished under normal use will be free from defects in workmanship for a period of two (2) year from the date of receipt. This warranty is valid only for the original purchaser. Some states do not allow limitations on implied warranties, so the above limitation may not apply to you. Cloudious9’s entire liability and your exclusive remedy under this warranty will be return of the defective product or part that does not meet Cloudious9’s limited warranty to Cloudious9 or Cloudious9’s authorized representative with a copy of your receipt. Any replacement Product will be warranted for the remainder of the original warranty period. If a warranty claim is received during this warranty period, Cloudious9 will conduct one or more of the following remedies, at its discretion: (1) exchange the defective part, (2) repair the defective product, (3) replace the product, or (4) refund the full purchase price. THIS WARRANTY GIVES YOU SPECIFIC LEGAL RIGHTS. YOU MAY HAVE OTHERS WHICH VARY FROM STATE TO STATE. This limited warranty is void if failure of the Product has resulted from accident, abuse, neglect, modification, or misapplication. You may not rent or lease the Product, but you may transfer your rights under this Agreement permanently, provided you transfer this Agreement, the Product, and all accompanying printed materials and provided the recipient agrees to the terms of this Agreement.